480P camera provides photo taking and video recording as well as FPV transmission. 2-Axis adjustable camera gimbal controlled by remote control. Dual high-power motor supply powerful strength. 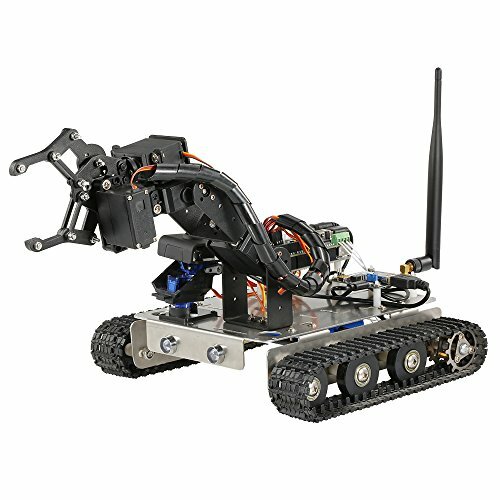 Wifi control, that you can use PC / Android / iOS device to control the robot. Stainless steel chassis strong and durable. Rechargeable high performance 12V 2200mAh battery, supporting stronger power and longer running time. 4DOF manipulator with 4 high power servos which is super flexible. Arduino 2560 main control to be your perfect education tool of coding enlightment for your kids. Charging time: 120 min approx. Working time: 30 min approx. Equipped with 480P camera allows you to take photos (on phone) and record video (on computer). Equipped with 2-Axis adjustable camera gimbal controlled by remote control. It supports wifi real-time video transmission, that you can use Windows/Android/IOS device to control the car. Multifunction stainless steel chassis compatible with a variety of equipment installation. With rechargeable high performance 12V 2200mAh lithium battery, supporting stronger power and longer running time. If you have any questions about this product by Goolsky, contact us by completing and submitting the form below. If you are looking for a specif part number, please include it with your message.